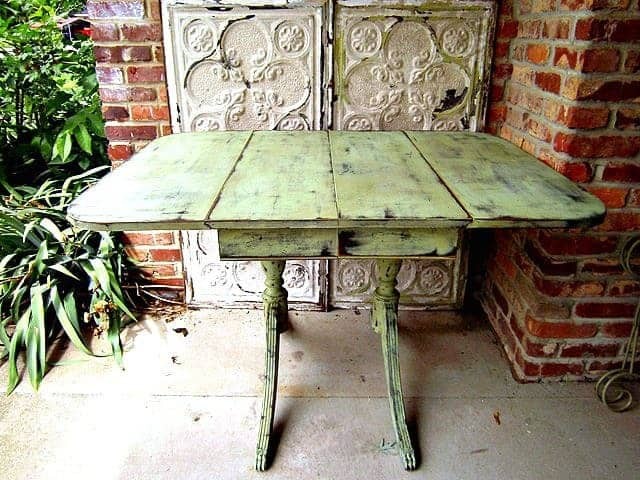 Learn how to paint a vintage drop leaf table. This paint technique is for layering paint on furniture. 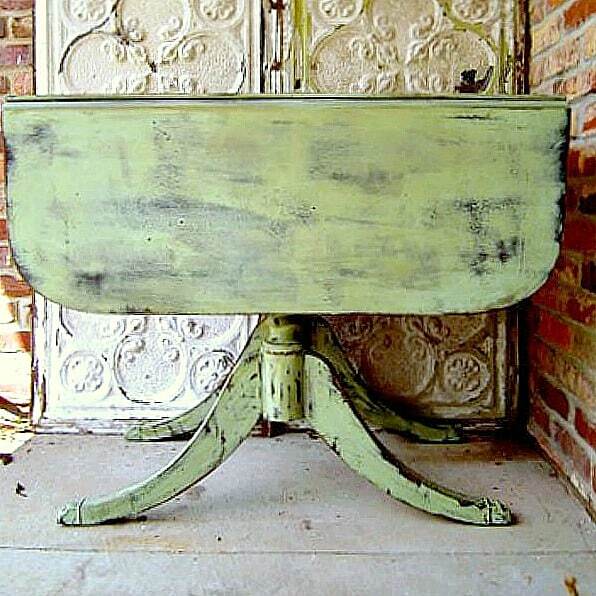 I chose green and black paint for the drop leaf table. The green and black are so pretty together. This is a drop-leaf table I found at one of my favorite junk shops. It needed a little bit of wood filler but otherwise was in great condition. The drop-leafs lock smoothly and are nice and straight. I always try to paint more than one piece of furniture at a time. With the prep work required in the painting process this seems to be a time saver. I had a large shelf and a chair stored away that needed painting and I decided to paint the three pieces with Caromal Colours Peppercorn (black) basecoat. The shelf and chair were finished in Peppercorn only but I wanted the table to have a two-tone aged look. I decided to paint the top a spring green color and leave the legs peppercorn. To achieve the two-tone color I applied a coat of Caromal Colours Chipping Creme over the Peppercorn basecoat. Although the chipping creme is white when applied, it dries clear. I mixed a spring green color using Caromal Colours Reclaim bright white and a green acrylic paint. I mix my own colors to get a unique one-of-a-kind look. Here is the tabletop with the overcoat of green, sanded so the peppercorn shows through. I did not like the table legs with the peppercorn finish. This is one of those times when the picture in my mind did not match the finished product. That being said I put a layer of chipping creme on the legs and painted the spring green on them to match the top. I polished the table with Howards Paste Wax in Oak to give it an aged look and also to protect the finish. I often have a finished look in mind when I start a piece but sometimes I have to change midstream. I’m glad I painted the table legs to match the top. You know my motto, when I look at a piece and it “makes me smile” it’s a good day. Thanks for checking in, that’s it for today. Next post will be on the cedar chest I bought at the Nashville Flea Market. Beautiful job Kathy! I love that green color! That is one great color…and love the black peeking through. oh i love the color! and the weathered look! it's another gorgeous piece! Your table looks awesome! I have to tell you (even though I'm showing my age) I love the name of your blog!! Petticoat Junction was my favorite show growing up!! Remember Uncle Joe?! I would love for you to link up Thursday (actually it starts tonight) to It’s a Party! Absolutely gorgeous! I love the color and distressed finish you gave it. 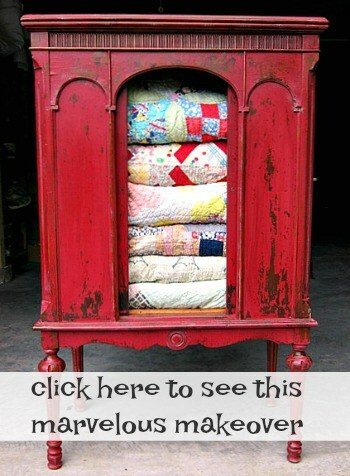 I also enjoy giving new life to reclaimed items. My mother recently did her kitchen in a similar green. I will have to show her your handy-work on this table. Just found you via Debbie's newbie party. I'm your newest follower! You have done a marvelous job on painting this table. Love it! I love how the green table turned out. I am your newest follower. Absolutely beautiful! If I saw it in a store I'd buy it in a heartbeat! You make painting such beautiful furniture look so easy. Thanks so much for sharing! P.S. 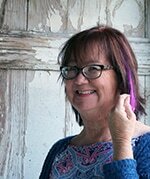 I've really enjoyed my visit and I am now one of your newest followers. I'm looking forward to following. Beautiful transformation! I love the color of the table. You did a great job. I going to have to check out this chipping creme. Beautiful – love the colour! That is one fine looking table. I love the color you chose too, as well as the technique. Thanks for sharing with my newbie party. Enjoy! Hi Kathy, it turned out great, love that wonderful green, I'm going to have to check out this “chipping cream”! thanks for linking up to VIF. I love this! The table is fabulous! I have one of these to paint and you have given me a great idea! Thanks for sharing this! Beautiful! Love the color. Thank you so much for sharing it with us this past week at Inspiration Friday! I really, really like that finish. It came out perfect. Your style is right up my alley! I read the whole post eating it up. I am not familiar with the paint product you used so I was really glad you included the names. I am going to look into finding some. PS~Found you through the link up at The Picket Fence. One more thing…I am not familiar with Caromal Colours or chipping creme. Guess I could goggle it but I'd also like to know if you would recommend chipping creme over various other methods. I'm with you on painting the legs. I liked that you showed it both ways. I also like that you indiviulized it with a color that we don't see over and over again. In fact, I love the color. Drop leaf tables are my favorite so I'm completely smitten. The table is fabulous! What a great job you did. I would be delighted for you to join Potpourri Friday, currently in progress! Man, you are lucky, nothing ever turns out like it looked in my head! Ha! This is wonderful, I love the color and the chippy cream is pretty amazing! Man I love this table!! That color is Devine! Very pretty. I love that color green!! !